International Journal of Research in Health Sciences,2018,6,3,6-11. Associate Professor, Radio-Diagnosis, KPC Medical College and Hospital, Jadavpur, Kolkata-700 107, West Bengal, INDIA. One of the main elements of stability and normal functioning of the knee joint is anterior cruciate ligament (ACL). Therefore injury to the ACL can lead to substantial morbidity. Accurate and early diagnosis of ACL injury is most important for short and long-term patient management. Magnetic resonance imaging (MRI) with high tesla unit is the investigation of choice for evaluation of status of the ACL and other associated structures in the knee joint. Sagittal section very well demonstrates the full sweep of ACL and has been commonly used in the evaluation. 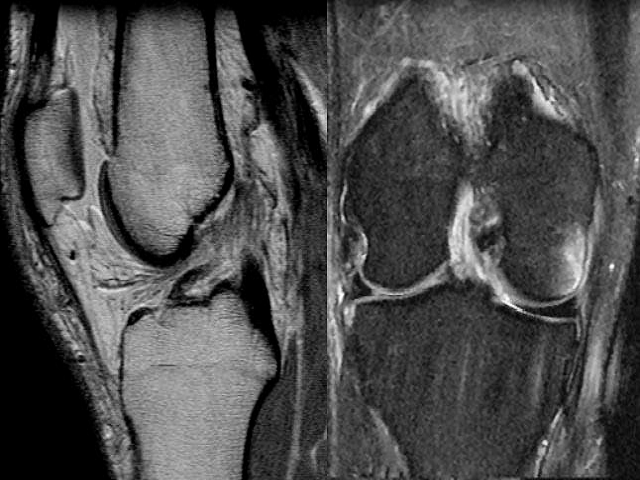 Coronal and axial images also contribute information about the ligament injury. Thus accuracy and confidence regarding diagnosis can be ready achieved. Different types of injuries like internal rotation and valgus and varus stress, hyperextension with external rotation etc are common way of ligamentous trauma. Understanding of these mechanisms of trauma is helpful in the MR diagnosis of ACL injury. MRI imaging can clearly demonstrate different internal derangement. Bone marrow oedema that commonly associates with the most cases of ACL injury can also be demonstrated.